UPPAbaby is an innovative American company with one mission: to make high-quality baby products that fit the needs of the life of a new parent whilst appealing to those with a sense of style. UPPAbaby is an innovative nursery brand on a mission to make high quality products that help make your life more efficient and stress free as a parent. With three decades of experience. UPPAbaby are always looking for new ways to make their pushchairs lighter, more savvy, easier and more fun to use. The UPPAbaby Vista 2018 is the ultimate in luxury pushchairs. It is a high quality, top of the range pushchair that comes with a carrycot and is suitable from birth. It is fully compatible with a range of car seats so can quickly and easily be converted into a full travel system. The UPPAbaby Vista 2018 is a must have for any style conscious family. The UPPAbaby Cruz 2018 is a stunning, high quality and very stylish pushchair. It is fully compatible with the UPPAbaby Carrycot which means you can make it suitable from birth all the way up to 15kg. It is also compatible with a range of car seats to convert it into a full travel system when required. The UPPAbaby MINU is UPPAbaby's newest lightweight pushchair that is perfect for travelling. Weighing in at only 6.7kg - it packs a lot of punch for such a compact stroller. Suitable form 3 months - 22kg (from birth with an additional 'from birth' kit), the UPPAbaby MINU is the only pushchair you need for your family holidays. UPPAbaby have also created a range of pushchair accessories that take the practicality and convenience of your pushchair to the next level. The UPPAbaby Vista Rumble Seat 2018 gives you an additional seat unit for your UPPAbaby Vista 2018 Pushchair. It can quickly and easily be attached to the chassis and can be used in either forward facing or rearward facing modes. The UPPAbaby Parent Organiser is a very simple yet very effective and convenient parent aid. Simply attach it to your pushchair and all the essential you need will be close to hand on your travels. 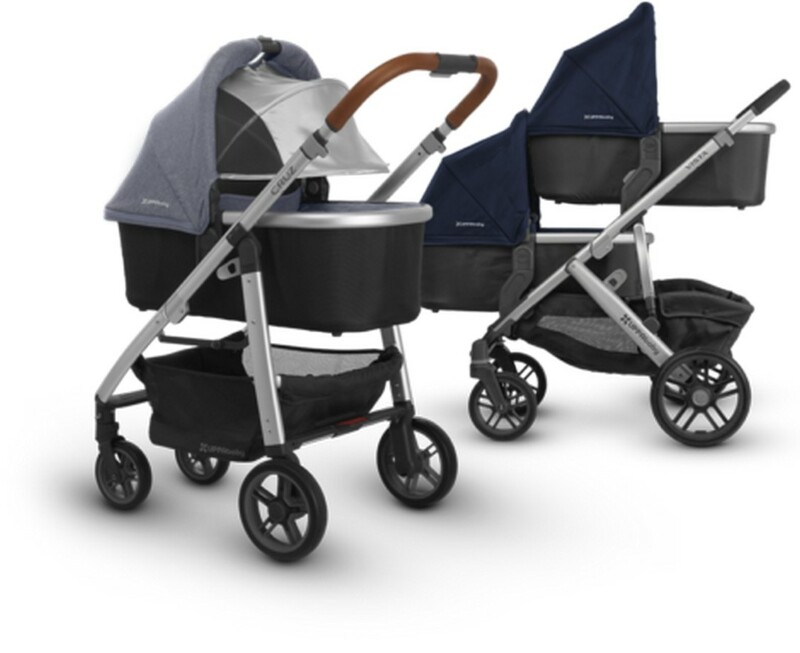 The UPPAbaby Cozy Ganoosh is designed to fit any UPPAbaby pushchair. It will keep your baby comfortable and warm, even on the coldest of days. It is fleece lined, water resistant and windproof. Perfect for keeping your baby snug and cozy on winter trips out. The UPPAbaby Carrycot 2018 is the perfect way to make your UPPAbaby Cruz suitable from birth or to add another carrycot (for twins) onto your UPPAbaby Vista.